A Smidgen of Sky by Dianna Dorisi Winget. Review: Are you the type of person who just dives right into an excellent book about heartache and humor, on a long weekend? 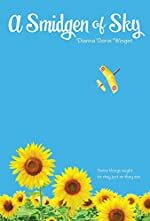 Well if so, A Smidgen of Sky by Dianna Dorisi Winget is the dream book for you! As you are reading you will witness Piper-Lee DeLuna attempt to sabotage her mother's wedding. Piper-Lee is 10 years old, and she lives with her mother because her father disappeared when he was flying his plane four years earlier. Now her mama is getting married again, and Piper- Lee thinks it is disloyal to her father. She doesn't want a stepdad, and definitely not a bratty and obnoxious stepsister. Everything spirals out of control when Piper- Lee has a plan to sabotage the wedding by getting the wedding called off. But by the time Piper- Lee finally realizes what damage she has done its too late. What is she going to do? A Smidgen of Sky has unique characters that made me want to keep reading. It teaches lessons, but is also extremely exciting. Some lessons are if you love someone you could do anything for them, or don't judge a book by its cover. This book is for all audiences but someone who is getting a stepparent, or stepsibling will appreciate the brilliant information the outstanding book provides. For someone who doesn't get along will their stepsiblings or stepparents, they can really relate to this story and maybe even learn how to get along with them. A Smidgen of Sky deserves 5 stars, because it is lively and full of action, which will make you want to keep reading. We would like to thank Houghton Mifflin Harcourt for providing a copy of A Smidgen of Sky for this review. Have you read A Smidgen of Sky? How would you rate it?